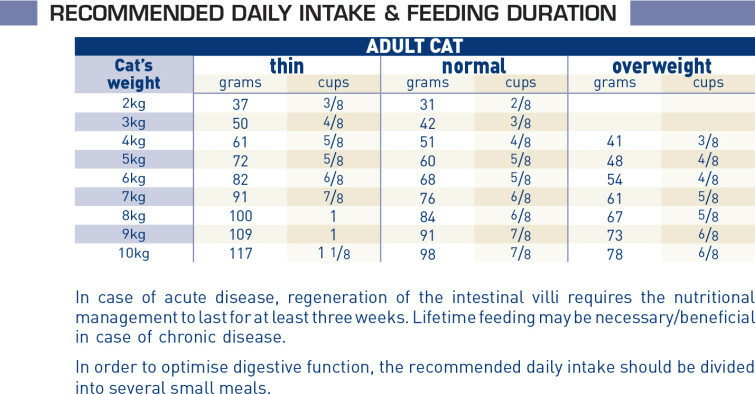 Gastro Intestinal For cats with acute and chronic diarrhoea, Inflammatory Bowel Disease (IBD), maldigestion, malabsorption, small intestinal bacterial overgrowth (SIBO), colitis, gastritis, convalescence, anorexia. Combination of highly digestible proteins (L.I.P* proteins), prebiotics, sugar beet pulp, rice and fish oil to ensure maximum digestive security. The high energy density fulfils energy requirements while helping reduce the amount of food given per meal, thus decreasing the digestive workload. It also facilitates convalescence and recovery. Dehydrated poultry protein, rice, animal fats, maize gluten, vegetable fibres, wheat gluten*, hydrolysed animal proteins, minerals, egg powder, beet pulp, fish oil, yeasts, soya oil, Fructo-Oligo-Saccharides (FOS), psyllium husks and seeds, hydrolysed yeast (source of Mannan-Oligo-Saccharides), marigold extract (source of lutein). Crude ash: 8.5%. Crude fibre: 5.2%. Crude oil fats: 22%. Moisture: 5.5%. Protein: 32%. Vitamin A: 21900IU, Vitamin D3: 800IU, E1 (Iron): 35mg, E2 (Iodine): 2.7mg, E4 (Copper): 6mg, E5 (Manganese): 46mg, E6 (Zinc): 150mg, E8 (Selenium): 0.06mg. Preservatives - Antioxidants.